WASHINGTON—The U.S. stock market rose sharply on Dec. 26 after staging its worst-ever Christmas Eve performance. The Dow Jones Industrial Average soared more than 1,000 points, posting its biggest daily point gain on record. The Dow closed almost 5 percent higher, recovering some of its losses from a four-day selloff. The S&P 500 index soared about 5 percent. The Nasdaq Composite also recorded its best performance since March 2009, climbing about 5.8 percent. Retail, technology, and energy stocks were among the best performers. Amazon rallied almost 9.5 percent, as the company announced record-breaking holiday sales. Facebook and Netflix also climbed more than 8 percent. Retailers also got a holiday boost. Data released by Mastercard SpendingPulse showed that retailers had their best holiday season in six years. Energy stocks also rebounded with a nearly 10-percent rise in oil prices on Dec. 26. The rally also marked the biggest post-Christmas gain in U.S. stock market history. 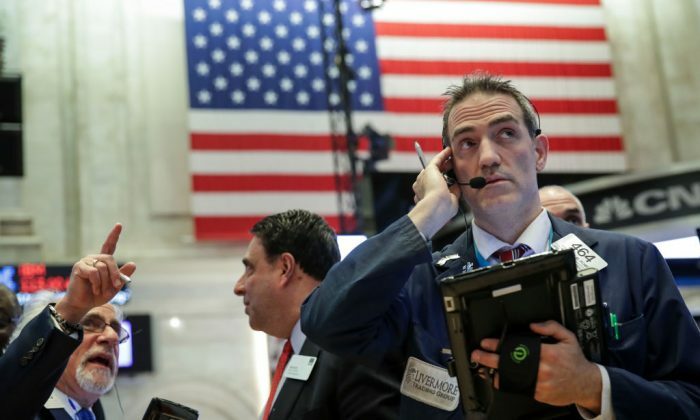 The Federal Reserve’s decision to boost interest rates, concerns about slower global growth, and a partial U.S. government shutdown have caused unease among investors, leading to a sharp drop in U.S. stock prices. The stocks saw their worst December and worst Christmas on record. The selloff erased more than $3 trillion in value from the S&P 500 index this month. Before the recent bounce, the index fell 20 percent from its recent peak, slipping into a bear market. Despite recent market swings, there is a good chance that stocks will continue to rise going into 2019. Historically, the last two weeks of the year and the first week of January are usually bullish times in the market, said Craig Kirsner, investment adviser at Stuart Estate Planning Wealth Advisors. “I think we will probably end up finishing the year going up, unless something crazy happens,” he said in an interview a day before the Fed’s most recent decision to raise interest rates. On Dec. 19, the U.S. central bank raised short-term interest rates by 25 basis points to a range of 2.25 percent to 2.50 percent, in line with market expectations. However, the Fed failed to signal that it was easing off its tighter policy approach as much as markets had expected. Hence, the stock market plunged after the Fed’s announcement. In a recent op-ed, the Wall Street Journal’s editorial board echoed Trump’s worries, urging Fed policymakers to pay attention to market signals. “The Fed is engaged in the unprecedented experiment of simultaneously unwinding its balance sheet and ‘normalizing’ interest rates,” the article said, adding that the consequences were hard to predict. “The wise course in this period is to pay close attention to current market signals—not merely lagging indicators like GDP and the jobless rate—and proceed with caution,” the report warned. Stocks fell for four straight trading days after the Fed raised its benchmark interest rate and signaled two more increases next year. Due to a sharp selloff in the stock market in December, valuations are now standing at below historical averages. The forward 12-month price-to-earnings (P/E) ratio, which is based on a calculation of the coming year’s earnings, is 14.2, according to data provider Factset. That ratio is below both the 5-year average of 16.4 and the 10-year average of 14.6. Although U.S. economic growth started to moderate from the “exceptionally strong pace” this year, the momentum remained strong, Goldman Sachs said in a report. The recent government shutdown has added uncertainty to the markets, as well. The federal government partially shut down on Dec. 21 after Congress failed to pass spending legislation. The effect of the shutdown on the economy would be “smaller than usual,” since Congress already passed bills for almost 75 percent of discretionary spending, Goldman Sachs said in another report. “We expect the effect on real GDP would amount to -0.07 percentage points per week of shutdown,” the report said.